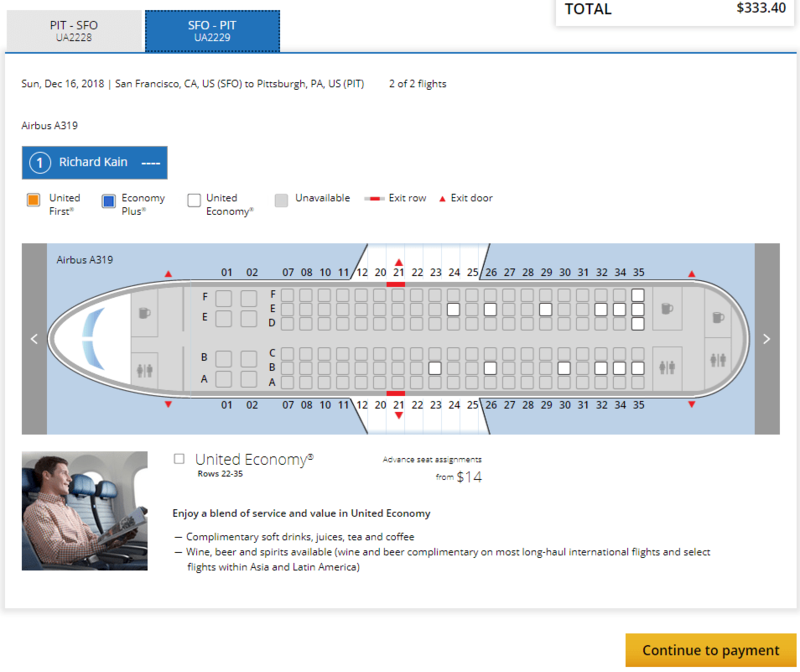 I’ve just bought a ticket on United Airlines to go from Pittsburgh to San Francisco – five hours, but non-stop and a very reasonable price. I should be in awe that I can get across the continent in hours, while enjoying a “blend of value and service” instead of being worried about ambushes by outlaws or stuck in the Rockies for the winter. I would not have noticed if the price were $14 higher. However, it needlessly irritates me when I am presented (both for the flights there and back with the following option): Pay to reserve a back middle seat, or one where the seat doesn’t go back! Now, they’re not all $14. You can get a spiffy aisle seat that doesn’t lean back across from the bathroom for a bit more – I think it was $20. So now I’m being asked to weigh these options…alongside all the other up-sells that will come later in the process. Let’s assume there is very sophisticated software that in short term windows makes good pricing decisions based on my status. If so, surely the engineers could eliminate generic all-purpose messages that apply to flights to, oh, Asia and Latin America. Clearly it is a good bet to take my chances on seat assignment. Since the price is $333 total it suggests it’s not likely completely booked and I stand a chance of a favored aisle or window on my own. I don’t feel ill-treated by the airline. United Airlines is ill-treating itself since the loss of goodwill is not quantified as their product marketers look at the funnel of behavior on their website. Previous Post Is the Organization or the Customer Taste Mediocre?